Buffalo Soldiers are part of America’s lexicon and collective legend. Perhaps this is because of our love of anything “Wild West.” Maybe, it is a little part hero worship. And of course, there’s that Bob Marley song. But beyond the mystique, there are some core truths: Those who were originally known as the Buffalo Soldiers were the first all-black standing units of the United States military in 1866. One of the groups, the 10th Cavalry, was formed and based here in Kansas, at Fort Leavenworth. 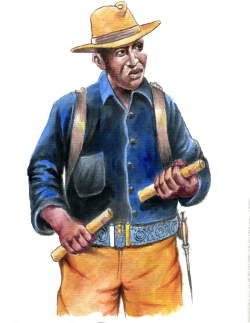 According to historian Robert Morris, the Buffalo Soldiers were recognized for their courage and discipline at a time when many white settlers on the frontier commonly thought black soldiers were disease carriers, cowards and likely deserters. In fact, their courage may be why it is believed some of the Native Americans they encountered gave the cavalry soldiers of the 10th, and their counterparts in the 9th, the unique moniker. Comparing these soldiers to the buffalo—a creature that fights fiercely even when wounded or cornered—would seem apropos. Of course, another story that the Indians thought the soldiers’ thick hair resembled the curly tuft of fur on the buffalos’ backs could be applicable as well. Either way, the animal would have been sacred to the Natives, and the soldiers came to wear the nickname with pride. The Buffalo Soldiers rode out into a nation that was full of expansion and conflict. Excited to stake claim on their own piece of land and make a fresh start, Euro-American settlers had begun to pour into the frontier. The government, battered and exhausted from five years of the Civil War, turned to formerly enslaved persons as a new way to fill the army’s ranks. For their part, the African-American men who joined the ranks had compelling reasons to enlist. Once they became soldiers, the men quickly realized the honor and glory would have to come after other things. Historian and filmmaker Kevin Willmott explains, “The Buffalo Soldiers were given the worst duties—things the white soldiers didn’t want to do like digging ditches, latrines and graves. And it wasn’t without harassment from white soldiers and settlers. 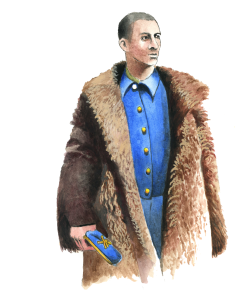 That was an ongoing obstacle.” The Buffalo Soldiers were given hand-me-down everything. From uniforms, to weapons and tools, even to horses. According to historian Tracy Barnett, the Buffalo Soldiers at Fort Leavenworth were told they had to put their housing in the lowest, swampiest areas. The result was sickness and death for some soldiers. Even with these conditions, the Buffalo Soldiers were given some of the most difficult tasks: to remove Native Americans in the Great Plains and Southwest and relocate them to “Indian territory,” which is now known as Oklahoma. It ended up being a three-decade-long campaign. They had been taught that Indians were “savages” who must be shown the “civilized” way of life. The journals and letters of the Buffalo Soldiers indicate that some of them were aware of this tragedy. “Every individual who put on the uniform had his own story, but many realized they were instruments of the government, helping to fight another group of people and aiding their own oppressors in displacing a people from their land,” says Johnson. African-American men had faced dilemmas in serving in the U.S. military even before the Buffalo Soldiers had come along. The first American to die in the Revolutionary War was a former slave named Crispus Attucks. And in the Continental Army, 5,000 troops were black while thousands others fought with the British, who in notable cases advanced and protected their status as free men. Black soldiers participated in 39 major battles and 410 lesser skirmishes during the Civil War. Fifteen states contributed volunteers to the United States Colored Troops (USCT), the official designation given to nearly all black formations in 1864. The 1st Kansas Colored Infantry and the 1st South Carolina Regiment were the first two black formations to be recruited and sent into combat. After the frontier battles, the Buffalo Soldiers were sent to various places, for a variety of campaigns—both major and minor. The 9th and 10th cavalries were sent to Cuba in 1898 to fight in the Spanish-American War. And even there, they continued to face prejudice. Signs in certain businesses told the black soldiers to stay away. They were instructed by their superiors to stay on the docked ship they arrived on while their white counterparts were allowed to leave the boat and travel about as they pleased. In the tropical Cuban climate they were not given lightweight uniforms to wear. Instead, they were expected to continue donning their heavy woolen uniforms. At the time, future president Theodore Roosevelt was second in command of the armed forces in Cuba. The famous “Rough Riders” he headed were in quite a jam when they lost their weapons and found themselves surrounded by heavily armed Spanish fighters. Five black cavalrymen won the Congressional Medal of Honor for their bravery during that campaign. Unfortunately, Roosevelt’s gratitude didn’t last. He later told newspaper reporters that the Buffalo Soldiers had been slow and cowardly. The record, however, belies his words. Other officers, however, became advocates for the Buffalo Soldiers. One of these was General John Pershing, who went on to command American forces during World War I. As a first lieutenant in 1895, he took command of the 10th Cavalry to help find and apprehend the famous Mexican revolutionary Pancho Villa. He personally chose the 10th for this assignment. Though they were unsuccessful, Pershing never forgot the tenacity and work ethic of his soldiers. Years later, General Pershing would be instrumental in having the all-black 92nd and 93rd infantry divisions fight in WW I, but under French command (because of newly enacted Jim Crow laws the soldiers were, in effect, shut out from fighting for America). They were the first Americans to fight in France in WW I and would continue to fight in that country for the duration of the war. Due to his association with the Buffalo Soldiers, Pershing was given the name of “Black Jack.” Although it was meant as a slight on his character, he liked it and kept the nickname. Johnson notes the soldiers would go on to serve at locations that were or would become national parks and sites across the United States: the Klondike Gold Rush National Historic Site in Alaska, the Haleakal National Park and Hawaii Volcanoes National Park in Hawaii and Glacier National Park in Montana. In a sense, any visitor to these locations owes a debt of gratitude to the Buffalo Soldiers. After President Truman desegregated the U.S. military in 1948, the Buffalo Soldiers’ days were numbered, and the all-black units were disbanded between 1951 and 1953. However, their legacy endures.